Go to the Spanish language site! Read about Sharon Greene, the founder of the Worldwide Circle of Friends. Check this out for all the special events for members of the Worldwide Circle of Friends. Do all your shopping for quality handmade items from fellow members of the Circle of Friends at our very own online mall. Take advantage of all the extras (swaps! contests!) membership has to offer by becoming a member! Share ideas, seeds, photos of your garden, plants and laughter! Unbelievable!! Take a minute to visit our members' sites! Jeanette is married to Graham for 45 years and they live near the beach, 500 metres from the back beach on the Mornington Peninsula at a place called Rye in Victoria, Australia, "Land Down Under"; not far from Sorrento and Portsea. They have three children, Karen, Mark and Jenni and nine grandchildren. Jeanette worked for 23 years as a School Librarian and then went into Equal Opportunity and Training and Development where she became the Manager of Equality for the Department of Justice. This involved the resolution of Sexual Harassment complaints within the Department which took in the Office of Corrections (all the prisons in Victoria), implementing the Action plans for women, Disability Employment programs and the Aboriginal Employment programs. In 1993 Graham and Jeanette took the package from the government and opened a small coffee shop in Rye which they had for nearly 2 years. When they retired from this they became Consultants and Jeanette worked for 6 years with the unemployed doing training and as a Case Manager getting people back into the work place. Graham worked in the computer industry as a Consultant in Project Management. Graham and Jeanette are retired now and loving it. Jeanette says of all the positions she has held she loved working with the unemployed the most as it was with out a doubt the most rewarding thing that she has done in life. They have two dogs, Jake (Bucheon Freize) and Gismo (Shitzu). Jeanette's favourite colour is blue and she loves going to the movies, cooking, craft, embroidery and her greatest love is gardening. She spends a lot of time in her acre of cottage garden. She is the Activites Officer for the Rye Beach Probus Club and she organizes all the activities and outings -- they have over 26 activities and it is wonderful. Jeanette is our movie review gal and you can read some of her reviews of movies here. “A ball is a circle. No beginning, no end. is the treasure of friendship you've granted to me. 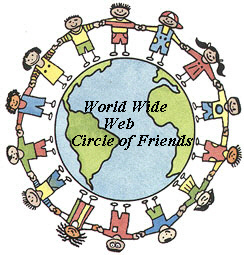 To join the Worldwide Circle of Friends, click here. A chain of cable and wire without an end. There's lots to do and plenty of friends to meet in the Worldwide Circle of Friends! We have people from all over the world who meet, chat and share experiences. Find out more about us in the site, look at the and then be sure to join in! Send an Anita's Designs Friendship Flower! Copyright 2000-2004 © Worldwide Circle of Friends. All rights reserved. Floribunda Initial Font courtesy of IconBAZAAR. the copyright owner's written permission.